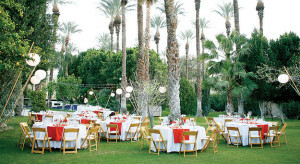 Just like every other city, Palm Springs is home to many weddings every year. There are many scenic locations for pictures that show the desert, the mountains, or fantastic hotel panoramic views. If you’re getting married in Palm Springs there’s so much to choose from. It can be sometimes difficult to decide where to get married and where to hold your wedding celebration. One of the big advantages that Palm Springs has is that it has an average of 350 days every year of sunshine. They do have rain, they do have high winds, and sometimes the temperatures are cool but for the most part you have a higher probability of having a great day on your wedding than almost any other location in the country. February and March are almost perfect in terms of temperatures after that it gets pretty warm. Once you get into April and beyond, daytime temperatures can reach over 100°F. In the fall during October and November is a nice time where the temperatures are in the mid-80s. December January and even early February are also perfect temperatures for getting married However the evenings can be quite cool. Plan your wedding in Palm Springs based on the temperatures as well as the availability of hotel rooms and venues to hold your wedding party. January through March is the season when the snowbirds come to town. Any other time of the year almost is a better time to hold your wedding. You do not have to worry about competing for hotel rooms and party venues. Palm Springs organizes many party venues during the year. The motorcycle Harley-Davidson weekends to golf weekends and more Palm Springs is host to many activities during the year. If you’re planning your wedding around one of these events you may want to steer clear to avoid having to pay top dollar for hotel rooms and party vendors.